If you don't already have a Diigo account, you can easily create one. 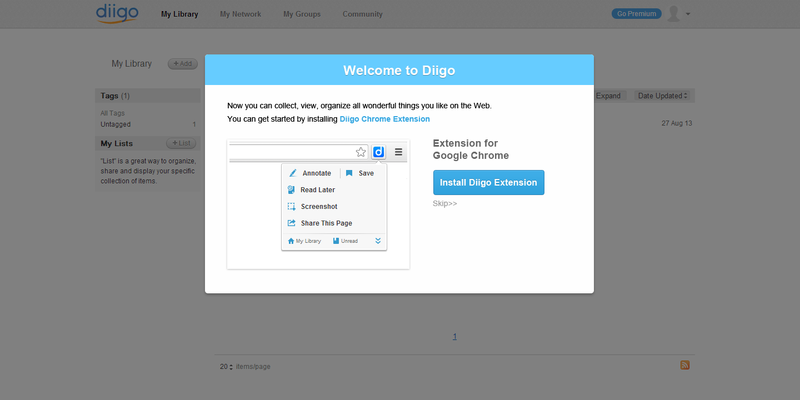 Once you have signed up and signed in, you will be presented with the option to install the Diigo extension. Choose “Install Diigo Extension”. After the extension installs, the Diigo Chrome extension icon will appear to the right of the address bar. If you skip in this step, you can still install the extension from the Chrome Web Store. Click the Diigo extension button to open the menu. From this menu you can access all the things Diigo can do for you. Use the “Save” option to bookmark a page. Bookmarking saves a link to the page in your online Diigo library, allowing you to easily access it later. 1) Annotate on readability page. "Annotate Article" option opens the readability page where you can do annotation in an ads-free enviroment. The annotation toolbar will appear on the right side of the page. It can be used to highlight, annotate, and make notes on a web page. 2) Annotate on the original page. Highlighting can be accomplished from the context pop-up. After the Chrome extension is installed, whenever you select text on a webpage, the context pop-up will appear, allowing you to accomplish text-related annotation. Highlight Pop-up Menu – After you highlight some text, position your mouse cursor over it and the highlight pop-up menu will appear. The highlight pop-up menu allows you to change color, add notes to, share, or delete the highlight. Clicking "Annotate PDF" opens "a new tab" where you can import a PDF file to annotate. Screenshot allows you to capture part of a page and work with it visually as an image. Clicking “screenshot” enters screenshot mode on the current page. Screenshot mode allows you to select an area of the page to capture, then add text, arrows, and shapes. This option saves the page to your library as “unread” and closes the tab. This encourages you to stay on task, knowing you’ll be able to read those interesting bits later. This option allows you to share a link of your annotated version of a page. Click “Share This Page” on the menu to share through Twitter, Facebook, Google+, or E-mail. Click "My Library" in the menu to open your library in a new tab. “My Library” is where all the items you’ve collected on the web are stored along with all the related content you have added to them. The “My Library” page lets you find, sort, organize and share your items. Find an item by searching or filtering your library. Organize by adding tags, or adding items to a list. Share by changing an item from private to public, or by sharing an item to a group. Now you know the basics of using Diigo. Go build your library and share with friends, co-workers, and family! 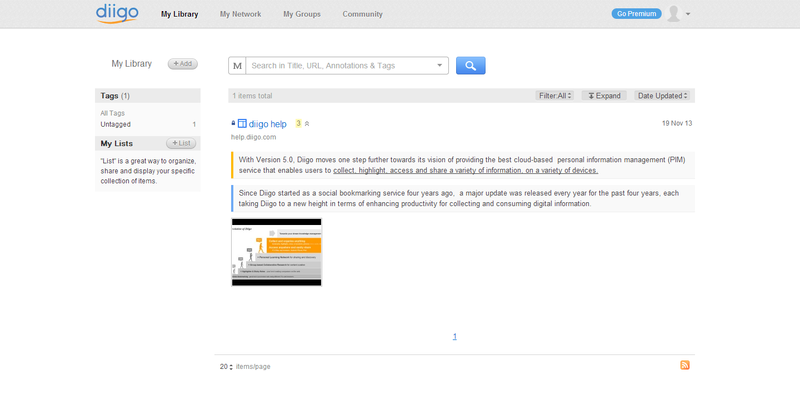 We are working on help documentation for all the Diigo features. We want to make sure you have a great experience using Diigo. We hope you'll work with us to make Diigo the best tool for reading, researching, and sharing! Remember to ask us your questions, and give us your feedback.